So, if you find managing social media channels hard and time-consuming, then take a look at this list of awesome tools to manage social networks, easily! I have listed the tools in two sections — “top picks” lists the best yet free-to-start social media tools, and “more tools” lists other free and premium tools available in the market. Using its analytics feature, you can check the performance of your shared posts and determine the content that best suits your audience. What I also like is that Buffer helps to deliver the posts at ideal times, and thus amplifies your audience’s reach. Moreover, you can do most of these tasks on the go using its mobile apps for Android and iOS. Price: Free for basic functionality; USD10 – 99 for premium features. Supports: Facebook, Twitter, Google+, LinkedIn, Pinterest, and Instagram. It supports multiple social media networks as well as YouTube and WordPress, unlike many others. You can bulk schedule posts by uploading them in a CSV file. Interestingly, like Buffer, you can also manage your scheduled posts on the go using the mobile app for Android as well as iOS. Price: Free for a limited plan; USD19 – 499 for premium plans. Supports: Facebook, Twitter, Google+, WordPress, LinkedIn, YouTube, and Instagram. 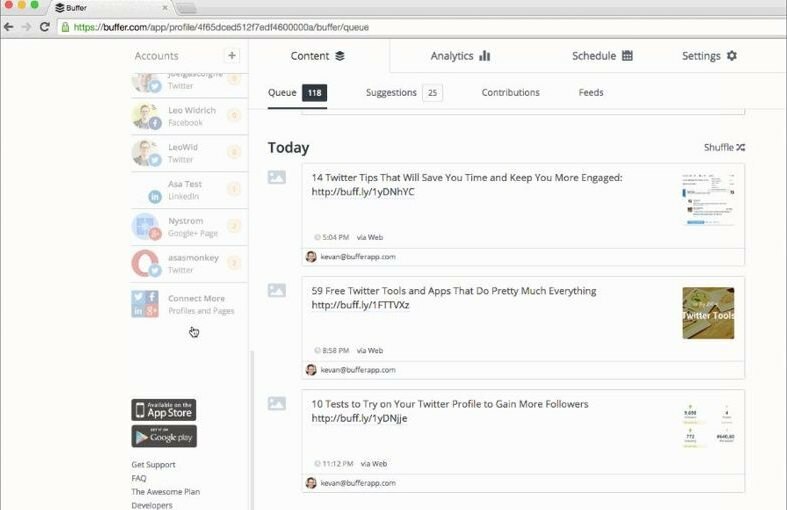 Slack Social displays graphical, easy-to-digest analysis of your posts for a better understanding of your campaign’s performance. 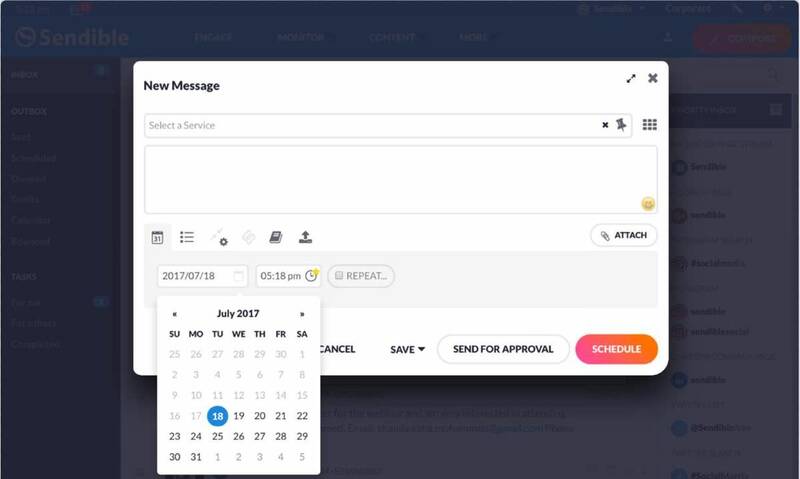 What I liked about it is that one can also view the real-time status of the scheduled posts and manage the social network profiles as well as the scheduled posts as easily as making some clicks. Price: Free for basic functionality; USD7 – 14 for paid features. Supports: Facebook, Twitter, LinkedIn, Blogger, and Tumblr. You can preview and plan the social posts with Later’s drag and drop preview for mobile and desktop platforms, allowing you to preview posts before scheduling them. Furthermore, you can search, curate, and repost content, and track all your posts to check analytics like followers and clicks and it has a mobile app to help you plan on the go. Price: Free for basic account holders; USD 9 – 49 per month for premium. Supports: Facebook, Twitter, Instagram, and Pinterest. 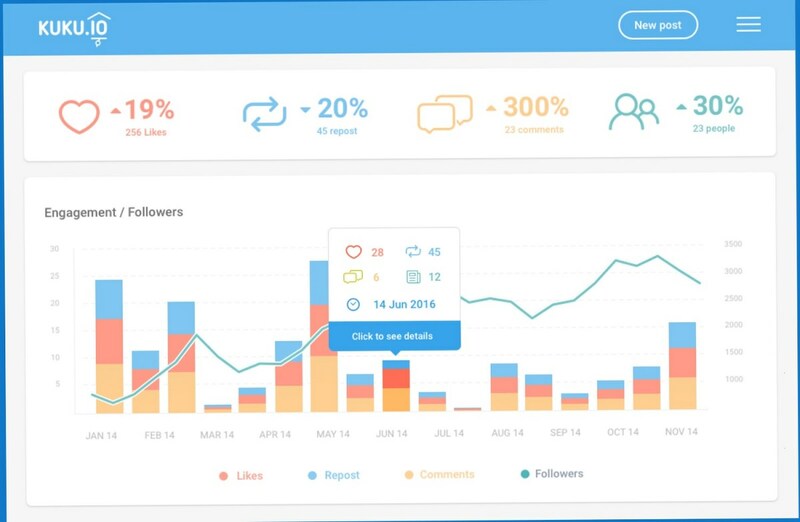 Postfity tool lets you engage your audience effectively and see the statistics in real-time for all connected social accounts. 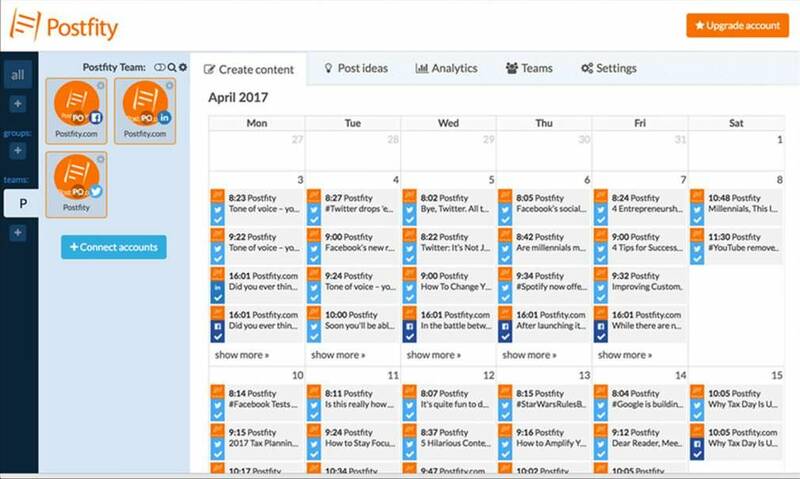 You can add multiple social accounts and plan your content on daily, weekly, or monthly basis. Postfity also includes an inbuilt content recommendation system that provides meaningful and inspirational posts. The posts can be added to the queue and the app will publish them periodically at the defined hours. 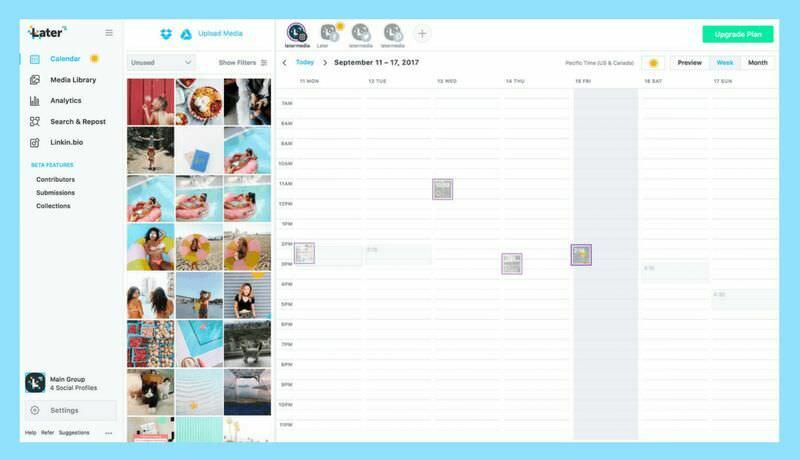 It helps you save time, and schedule posts for all your social media profiles in advance. And the posts can be managed from anywhere and can be scheduled on the go using its mobile apps for Android and iOS platforms. Price: Free for basic plans; USD 8 – 49 per month for premium plans. Supports: Facebook, Twitter, LinkedIn, Instagram, VKontakte, and Xing. 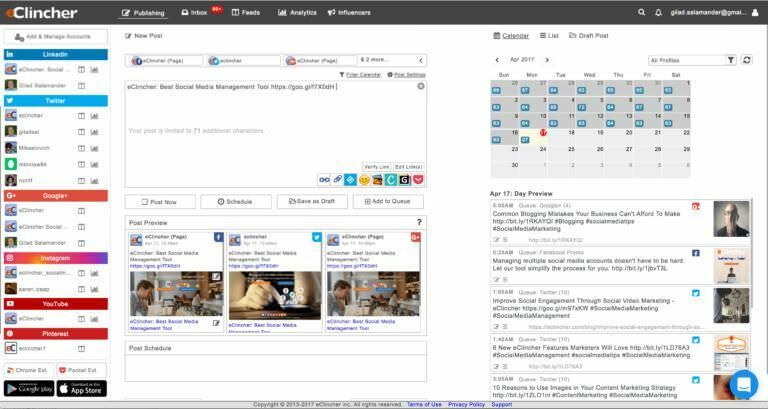 Zoho Social also lets you bulk schedule posts to multiple social networks. It also features team collaboration features to discuss and work with your team to craft the best ideas for content marketing. The tool also shares insights and analytics of your posts to help you understand the progress and develop a better social media strategy. Price: Free for basic functionality; USD10 – 50 per month for premium features. Supports: Facebook, Twitter, Google+, LinkedIn, and Instagram. Supports: Facebook, Twitter, Google+, LinkedIn, Instagram, Pinterest, Tumblr, Telegram, Vkontakte, and Ok.ru. 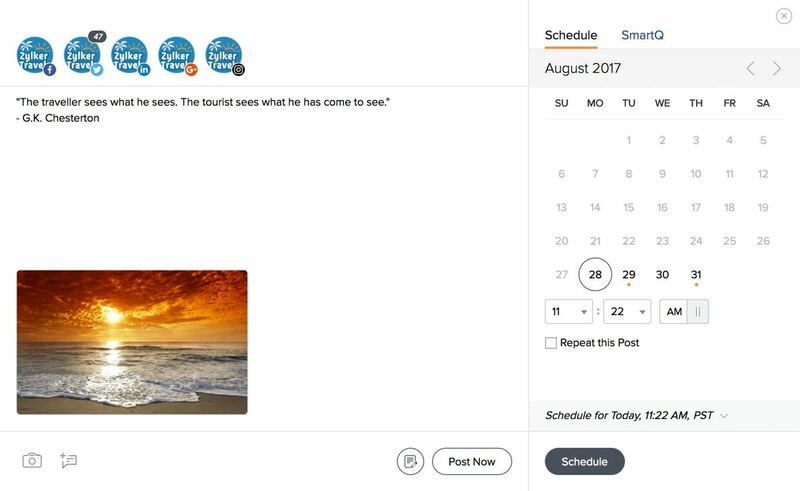 SmarterQueue allows you to schedule your social media posts in seconds with a drag and drop visual calendar. The tool can automatically recycle the evergreen content to reach maximum audience and maximize engagement. Moreover, you can curate contents from feeds and sites, and check performance analytics. Supports: Facebook, Twitter, LinkedIn, and Instagram, and Google+ and Pinterest are planned for the future. 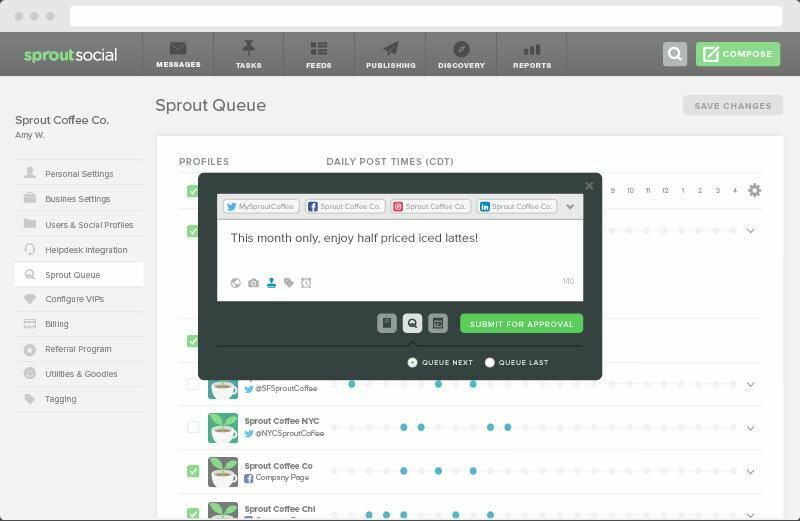 Sprout Social lets you effectively plan your social media strategy, and schedule messages across different platforms using its visual calendar. You can queue your posts, and edit multimedia contents with its built-in image editor. You can apply custom tags to messages and organize them, as well as check post analytics. 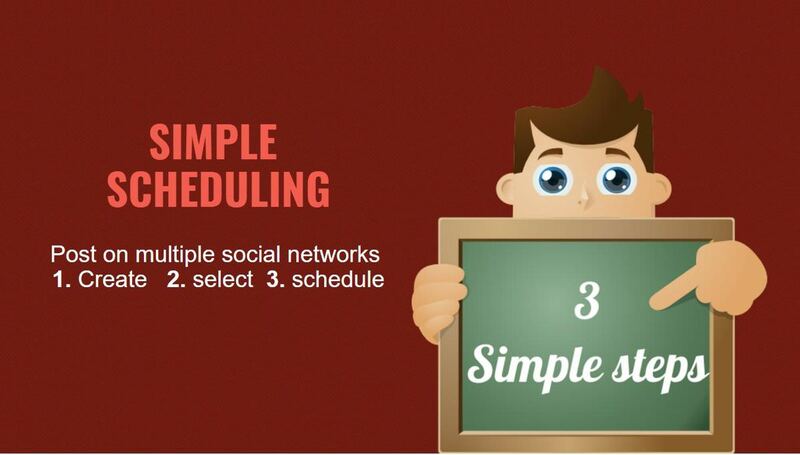 Sendible offers streamlined post scheduling with its efficient social media publishing tools. Interestingly, the posts can be scheduled in bulk to get published on multiple social networks. Its one amazing feature is that it automatically repeats the popular posts, and it can auto-post from RSS feeds. Also, its Smart Queues feature lets you group posts. 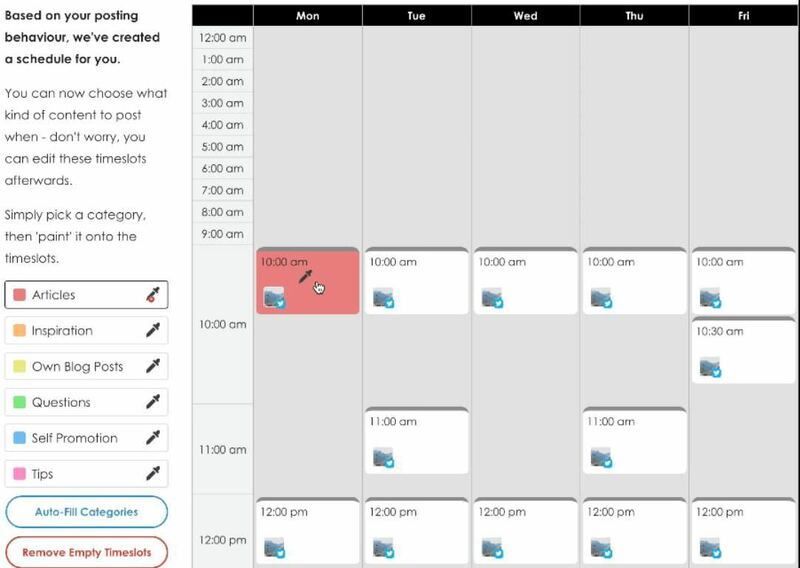 eClincher lets you plan your content on daily, weekly, and monthly basis using a smart calendar. Its automated post publisher saves you time and helps you get better results with your social media strategy. Another interesting feature is its support for Google’s URL shortener that auto-shortens the links in your posts and provides analytics. Buffer Yes Yes Facebook, Twitter, Google+, LinkedIn, Pinterest, and Instagram. Hootsuite Yes Yes Facebook, Twitter, Google+, WordPress, LinkedIn, YouTube, and Instagram. Slack Social Yes Yes Facebook, Twitter, LinkedIn, Blogger, and Tumblr. Later Yes Yes Facebook, Twitter, Instagram, and Pinterest. Postfity Yes Yes Facebook, Twitter, LinkedIn, Instagram, VKontakte, and Xing. 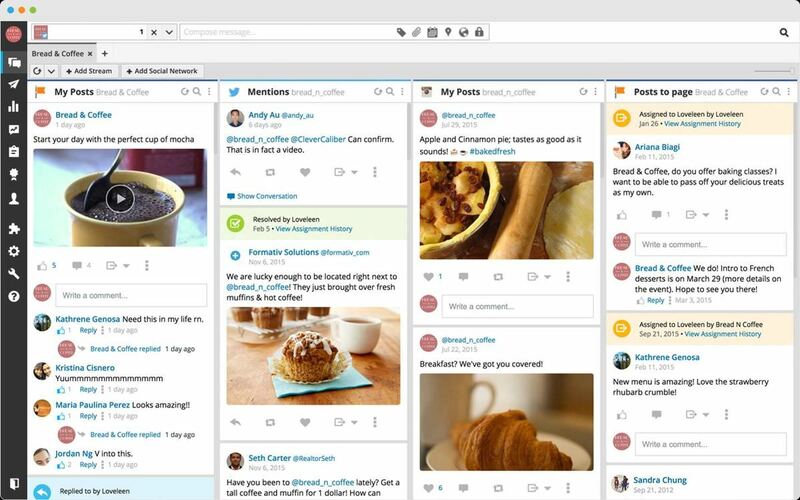 Zoho Social Yes Yes Facebook, Twitter, Google+, LinkedIn, and Instagram. Postcron Yes Yes Facebook, Twitter, Google+, LinkedIn, and Instagram. Kuku.io No Yes Facebook, Twitter, Google+, LinkedIn, Instagram, Pinterest, Tumblr, Telegram, Vkontakte, and Ok.ru. SmarterQueue No Yes Facebook, Twitter, LinkedIn, and Instagram, and Google+. Sprout Social No Yes Facebook, Twitter, Google+, LinkedIn, and Instagram. Sendible No Yes Facebook, Twitter, Google+, Linkedin, Instagram, and Pinterest.